Looking back at the clothing worn at milestone sixties events like the Summer of Love and the Woodstock Music Festival, the emergence of a free-thinking counter-culture rebelling against authority becomes evident. Considering the societal context leading up to events like Woodstock, it’s not surprising that young adults became disillusioned with the way the world was being lead. Wars, political upheaval, and the dawn of demonstration as a form of speaking one’s mind all influence the time. Kids, growing into adults disapproved of a war that kept half a million troops on the battlefield and ultimately resulted in the death of an estimated 2 million foreign civilians and another million fighters from both sides (as estimated by Vietnam in 1995), and nearly fifty-eight thousand members of the U.S. armed forces. All of this, together with the fact that this generation was the first to grow up with television and the ability to see the world through it. Fashion became a vehicle of voice and control. You might not be able to force the government to stop the war, but you can dress in a way that shows you believe in peace, love, and happiness, all things which are the opposite of war and conflict. Looking over photos from events like Woodstock, there’s a balanced dichotomy of the fashion. We see long, free-flowing maxi dresses balanced out by the lack of clothing in many of the attendees. We see strong, bright colors and tie-die, contrasted with neutral brown and natural tones. Even hairstyles reflected this same rebellious free-thinking – long bedraggled hair juxtaposed against the advent of short, clean pixie cut styles like those worn by Twiggy. 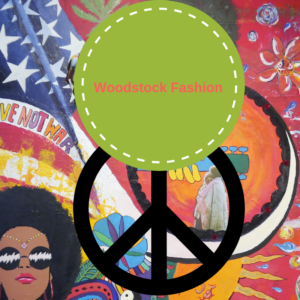 So, as we approach the fiftieth anniversary of Woodstock in 2019, it’s amazing to see so many of the styles that gained popularity back then still present in our wardrobes today. Whether those styles remain relevant because of their timeless design, or because they remind us of an important milestone of free-thinking and free expression. Either way, without the influence of sixties fashion, garments like flared jeans, maxi dresses, and peasant blouses might not be a part of today’s fashion pulse if it weren’t for their rise during the hippie/beat generation.